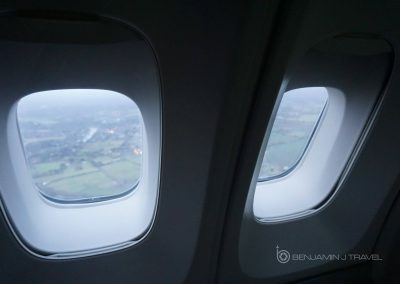 Bound for Ireland for the Thanksgiving holiday, this particular trip was extra special to me. My Dad has done so much for me throughout my life. Raising me, taking care of me, and helping mold me into the person I am today. In decades past, my dad has traveled to Mexico and Canada with the US Navy but this truly was going to be his first “overseas” trip. 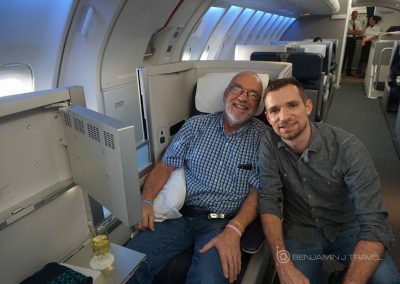 I travel so much for my blog and personal travel, but I wanted my Dad to experience travel as well. 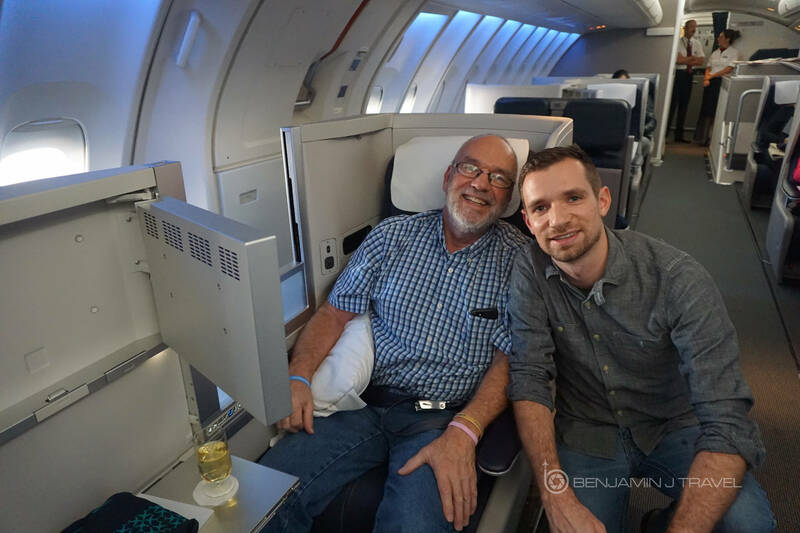 So I figured a great way to spoil him was on British Airways’ upper deck Club World on the 747! I had asked my Dad where he wanted to go and he had a a few places in mind but Ireland was at the top of his list. My dad majored in religious history in college so he has an affinity for the history of the church. Ireland offers any religion buff an infinite number of places to visit. Paired with natural beauty and reasonable costs, Ireland is an approachable travel destination. 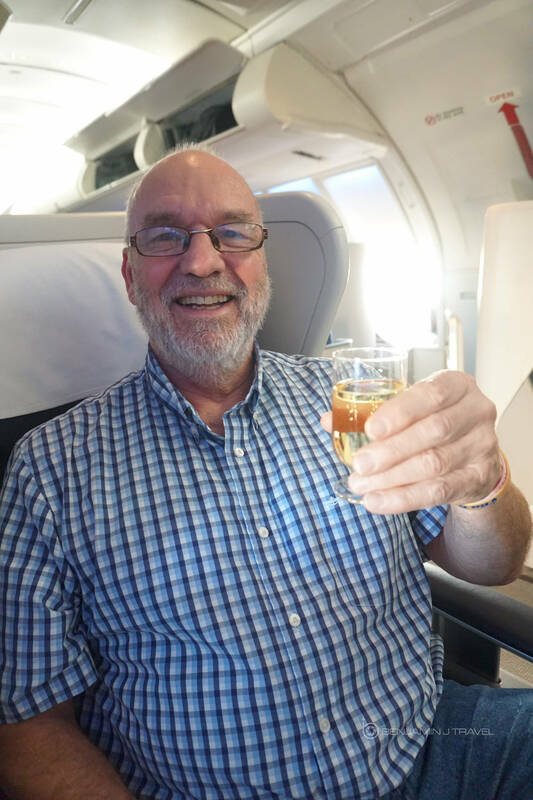 I waned my Dad to experience Business class so I booked him, Chris, and myself aboard British Airways’ upper deck Club World on the 747 with my stash of AAdvantage miles. 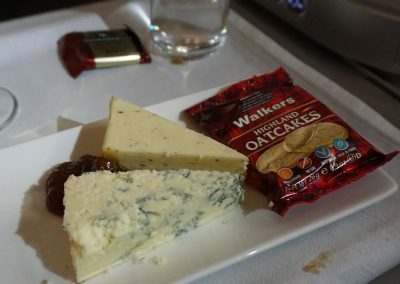 Awards tickets with British Airways come with steep fuel surcharges but considering the special occasion, I didn’t mind. 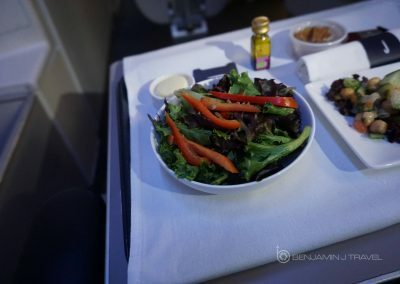 I had eyed availability in Business Class on American Airlines’ metal but it never came up. This would have meant not paying fuel surcharges but it also would mean not flying on the upper deck of the 747. On departure date, Chris and I arrived a few hours early at DFW as my Dad was connecting from an American flight from Lubbock. We checked our bags via First Class check-in Terminal D thanks to my OneWorld Emerald status which had no line. 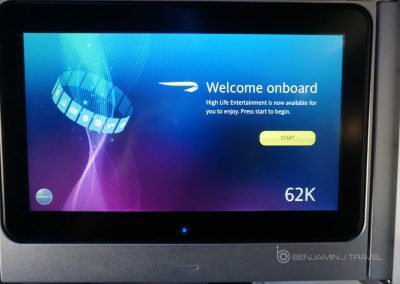 The gate agent offered First Class upgrades for purchase as were checking-in but we declined as Business Class is sufficient for me. Also, who wants to give up seats on the upper deck of a 747? 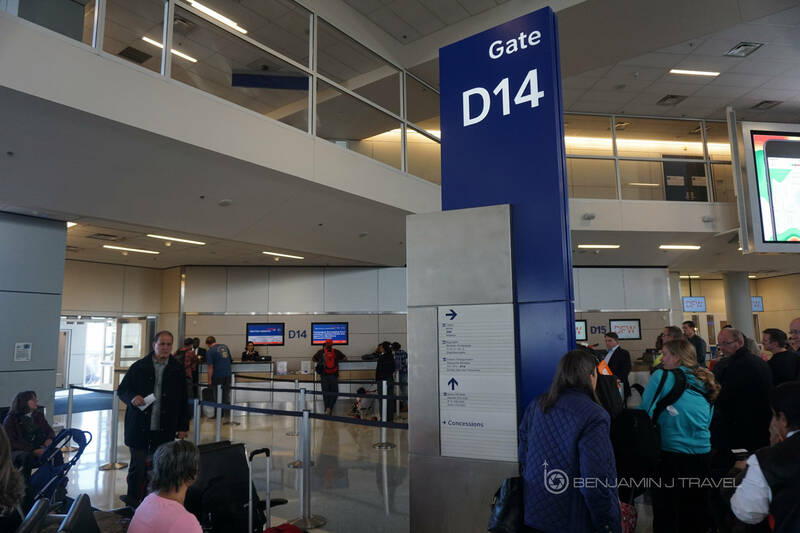 My Dad arrive about 1:30 PM from Lubbock and we met him at the Skylink tram station and headed over to the Amex Centurion Lounge in Terminal D, which was conveniently adjacent to our boarding gate, D14. 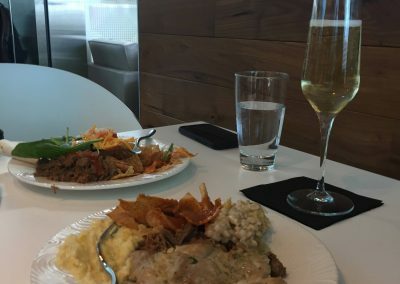 We had at least 2 hours to pass so we had plenty of time to have a couple of drinks and enjoy some of the tasty food in the Amex Centurion Lounge. My biggest complaint about the Amex Centurion Lounge is the overcrowding but on the day before Thanksgiving, the lounge wasn’t even half full. 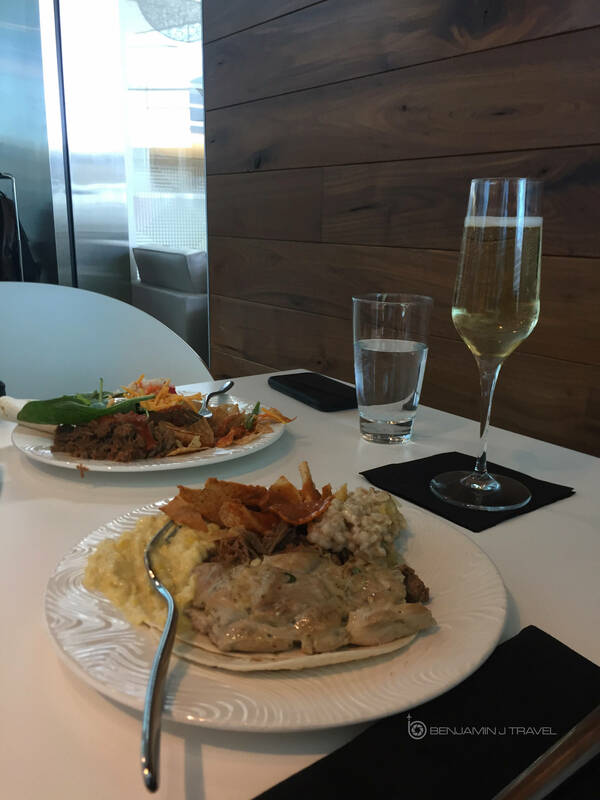 We could have also used the British Airways Lounge in Terminal D but I generally prefer the Amex Centurion Lounge for the food. 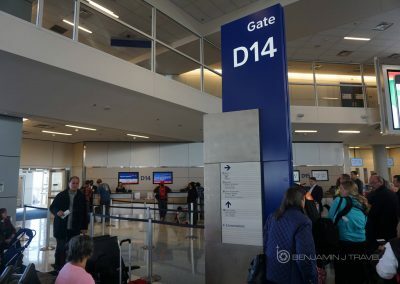 A few minutes before our scheduled boarding time, we walked over to D14 where boarding started right on time. 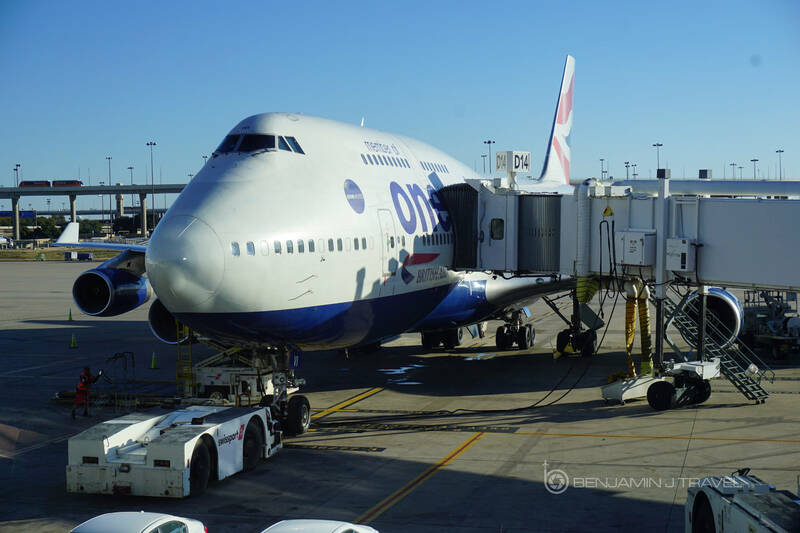 The boarding process was much smoother than our last British Airways departure out of DFW. First Class was called followed by Business Class and we boarded with the Business Class group. We boarding directly behind the First Class cabin and made a sharp right up the stairs to the upper deck. John and Hannah, who would be our crew on the upper deck, greeted us with smiles. 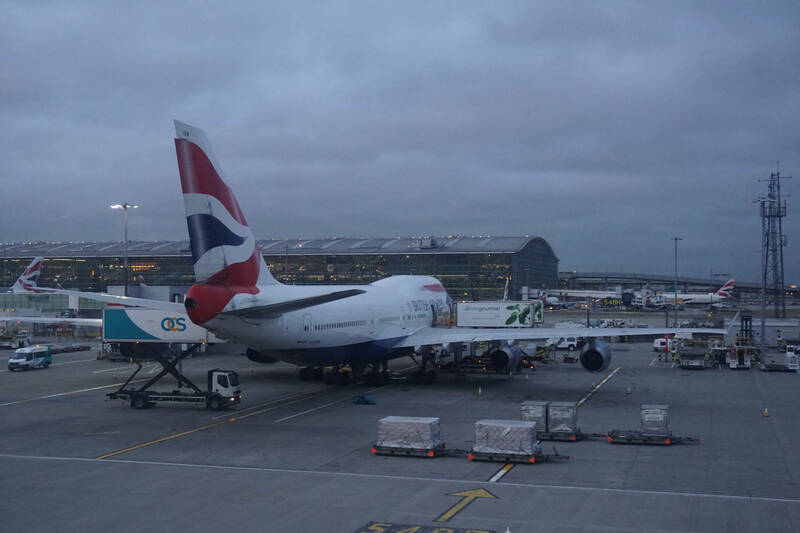 I took some time to snap a few photos and unload our bags before the cabin filled up. We took our seats in Row 62, myself in 62K, Dad in 62J, and Chris in 62B. 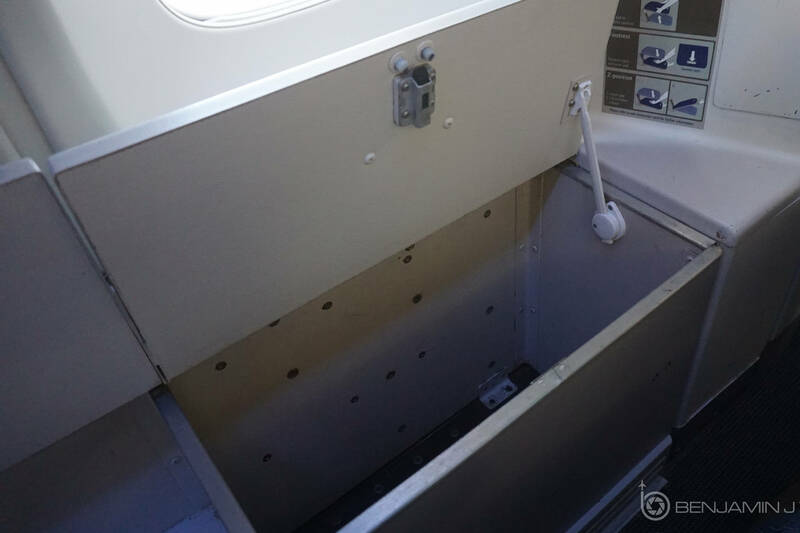 For the window seats in Row 62 (62A and 62J), these are exit row seats. 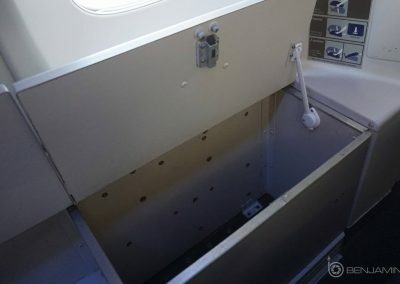 This gives you even more space between your feet and Row 63 along with room for meals to be served more easily by the crew. 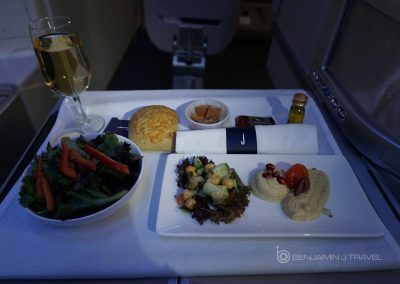 In most seats in Club World, meal trays need to be passed over the partitions. 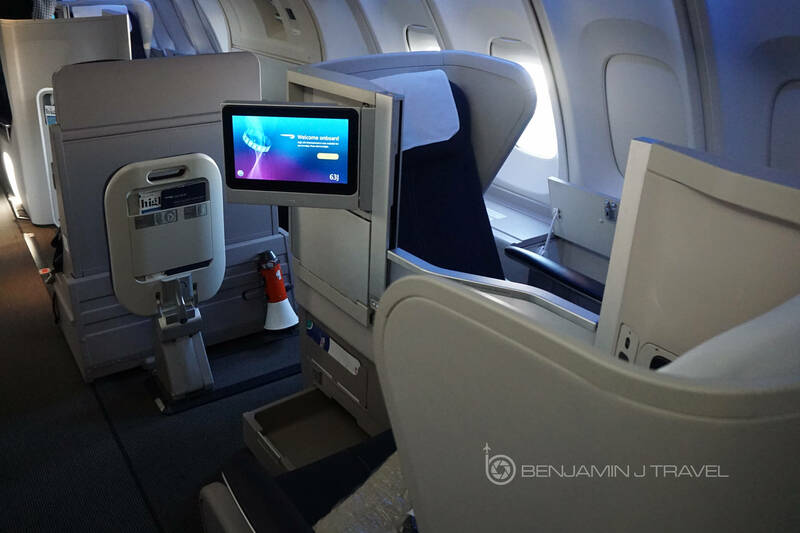 If you’re asking my opinion, 62A and 62J are the best seats in Club World on the 747. 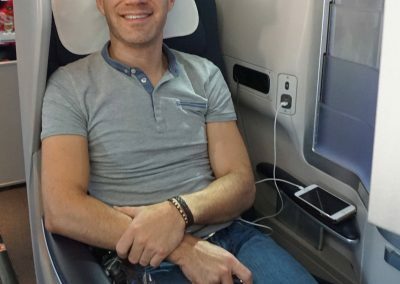 There’s a lot of strong opinions about the Club World seat on British Airways. 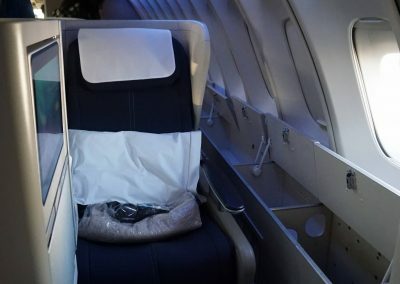 The seat itself isn’t bad as it’s lie-flat and privacy can be quite good in the window seats. But the 8-across configuration on many aircraft is a big negative. 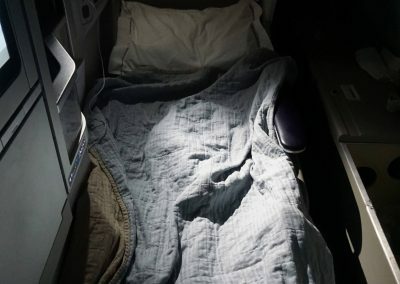 However, on the upper deck on the 747, that issue goes out the window. 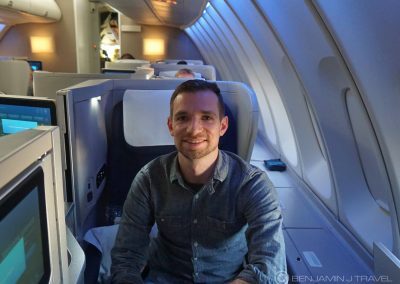 There are only 20 Club World seats on the upper deck on British Airway’s 747-400 creating a very private and intimate atmosphere. 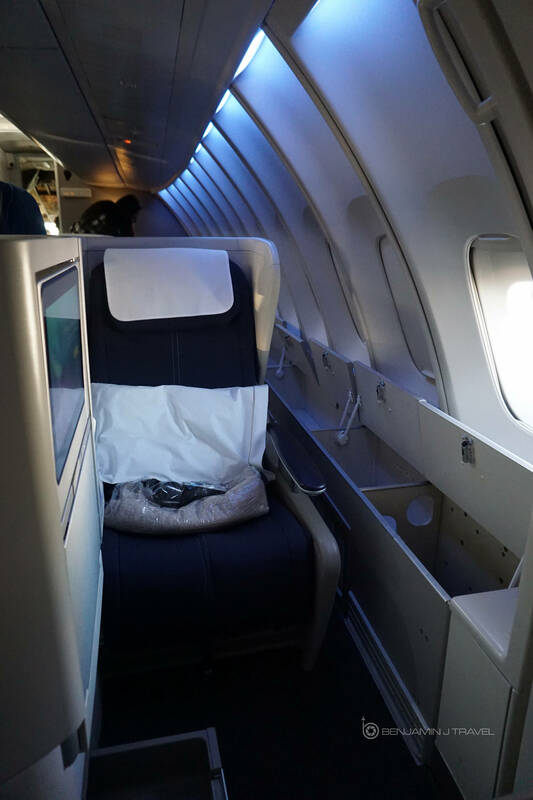 Aisles seats still offer much less privacy than the window seats but considering the smaller cabin on the upper deck, it’s not bad. 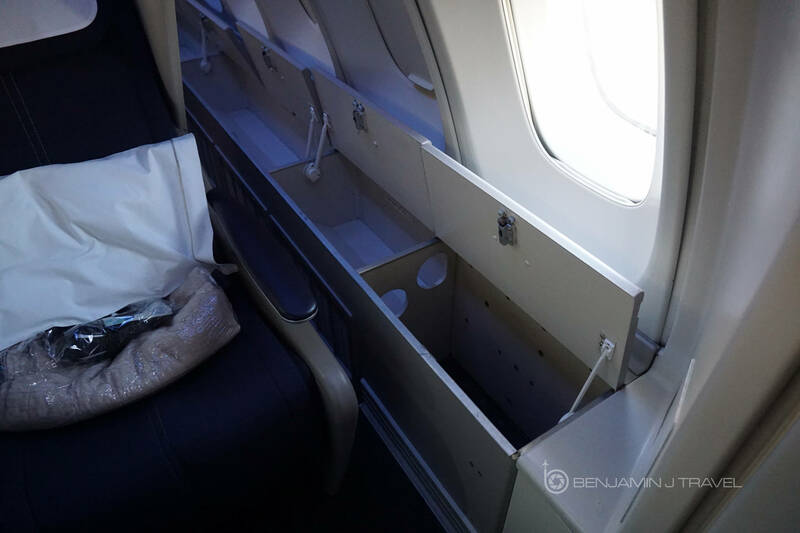 One of my favorite features on the upper deck is the window seat storage bins. I am not shy to admit that I love storage space! 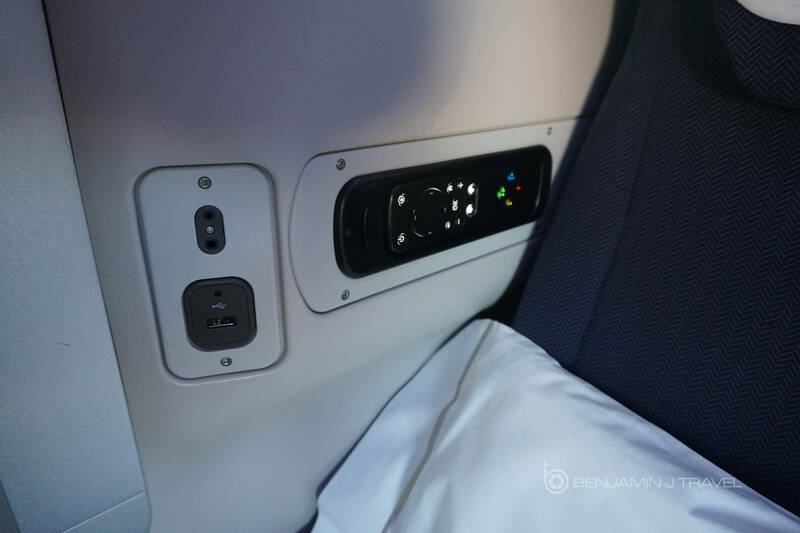 It’s so nice to be able to place smaller items in the arm-side storage bin rather than climbing in and out of your seat for the overhead bin. 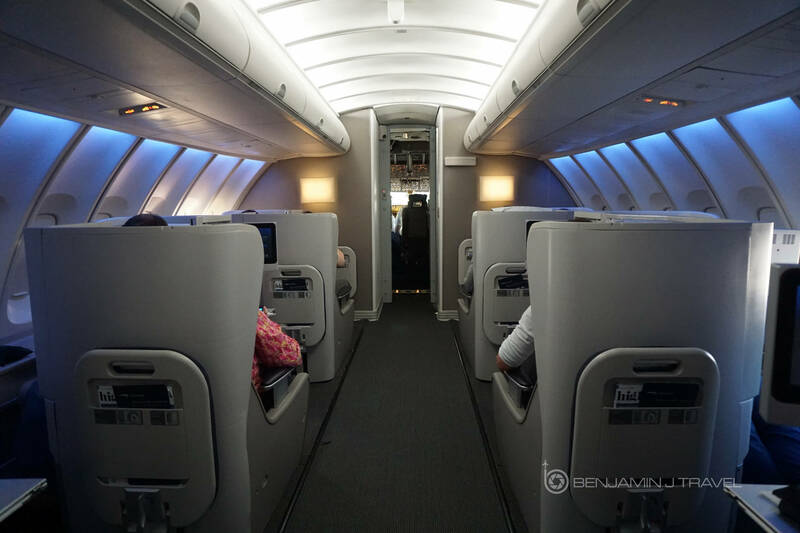 Keep in mind, there is a much larger Club World cabin on the lower deck of the 747 but it is not nearly as private. 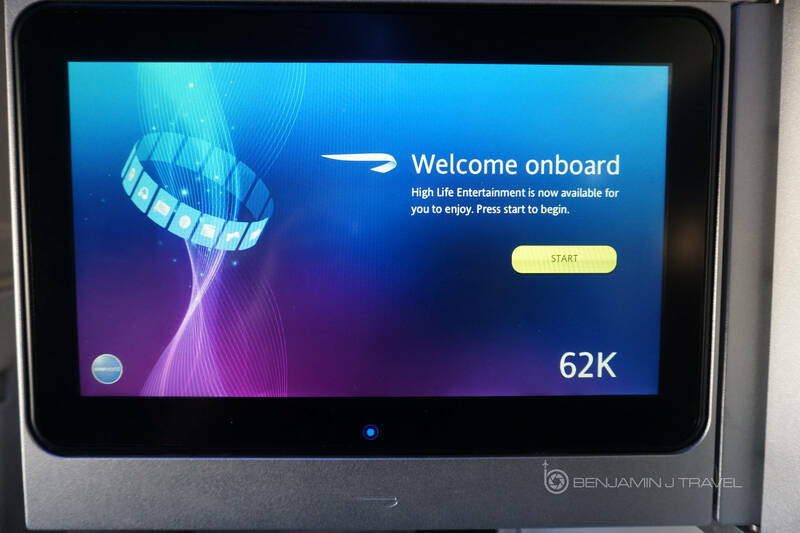 The seat has a very large IFE screen that folds out which must be put away after the safety video plays during taxi. 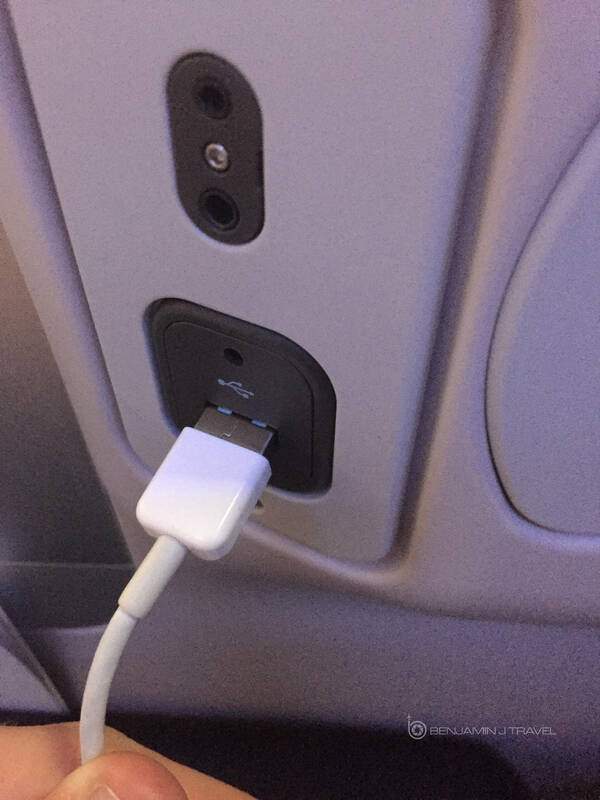 There are both AC and USB power outlets but the USB outlet at my seat was broken. Since there was an AC outlet, this was a minor issue. 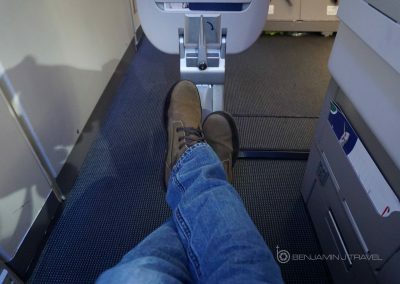 I like the big footrest in the Club World seat but it must be stowed during takeoff and landing. 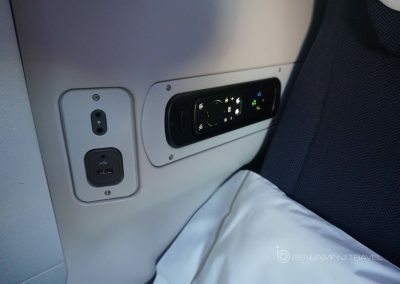 For privacy, there is a opaque partition between the aisle and window seat that can be raised and lowered with a button. 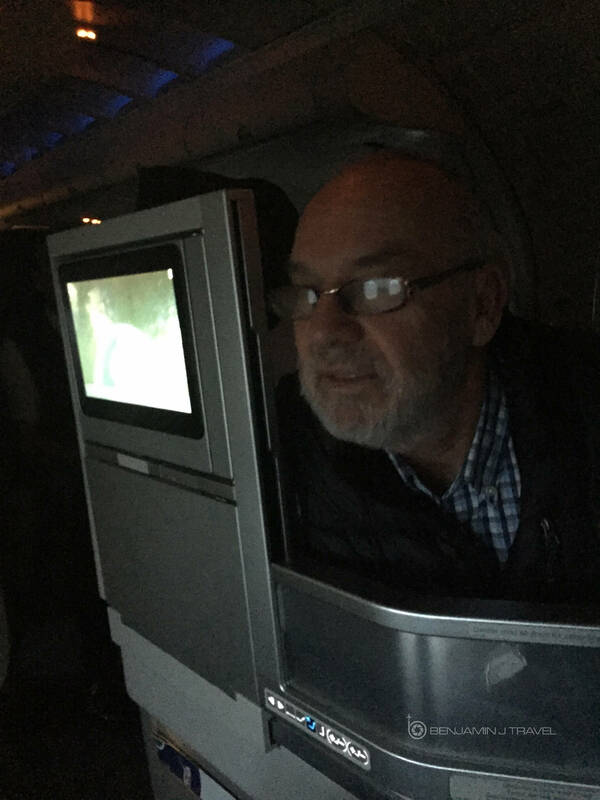 My Dad was immediately impressed and intrigued by all the features of his Club World seat. I took some time to walk him through all the bells and whistles of his seat. Hannah was a bit tickled by this and my Dad being the chatty guy he is, started a conversation with her right away. 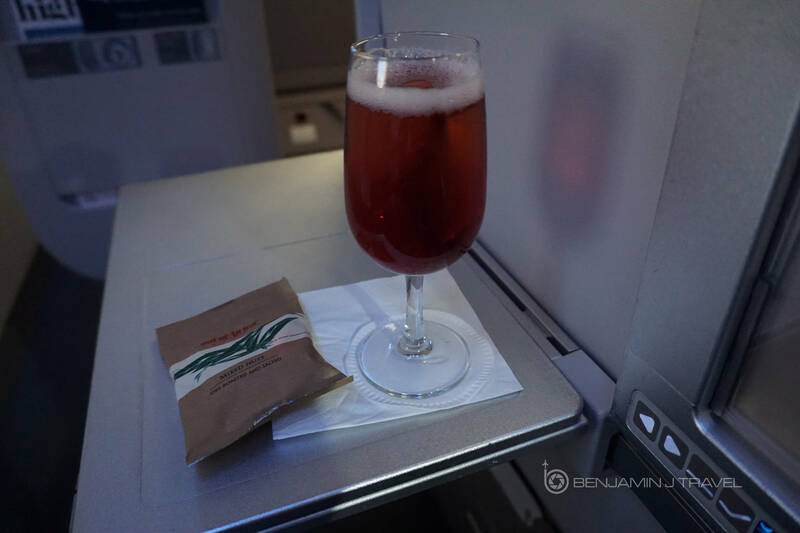 Pre-departure beverages were offered and we all indulged in a celebratory glass of champagne. Alternatively, water and orange juice were offered. We were soon on our way for departure just a few minutes behind schedule and were up in the air for London. 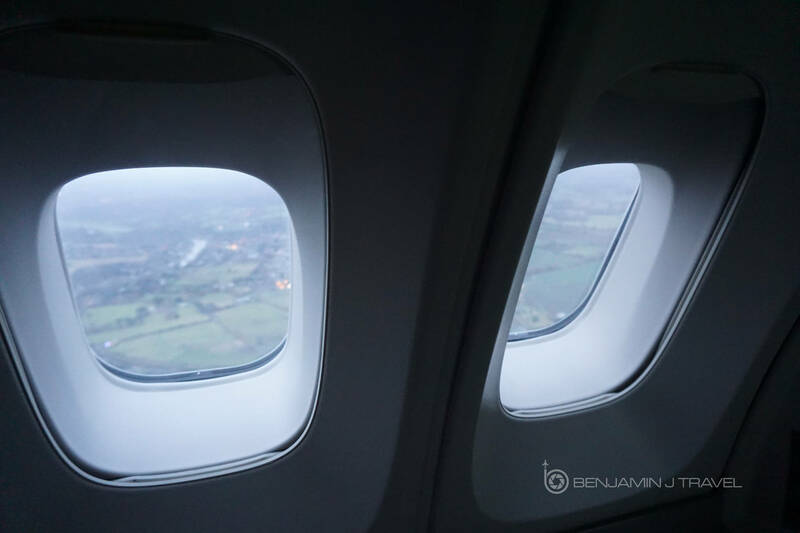 While I love sitting on the upper deck on the 747, for someone like me who takes lots of photos out the window, it’s a hard angle to photograph out the window. 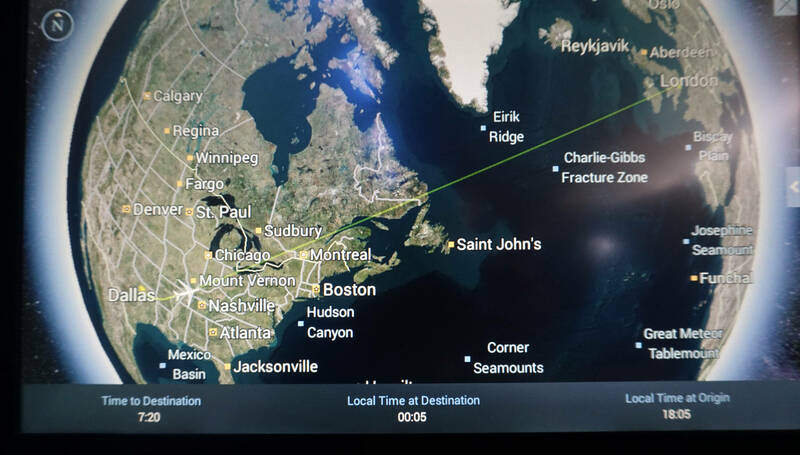 Once we reached cruising altitude, the crew came out and began with beverages and a snack mix. 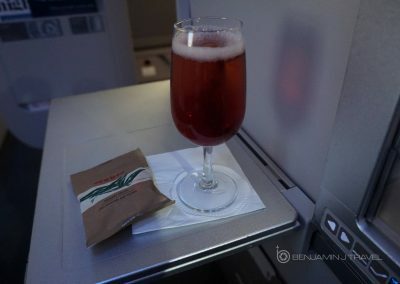 I started with a Kir Royale which is quite sweet so I can’t drink more than one. Dinner orders were taken along with the drink service. 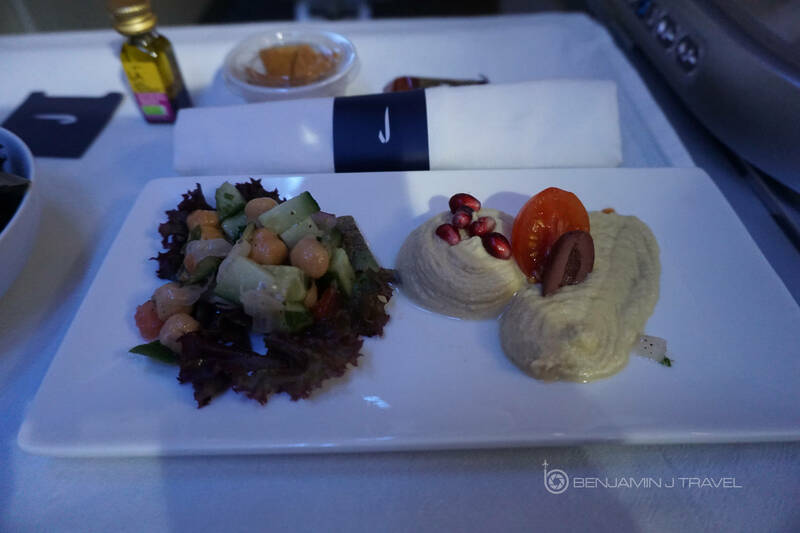 For the starter I opted for the mezze selection with hummus and baba ganoush. My dad ordered the same but Chris ordered the smoked salmon starter. While the mezze selection was good, I had a bite of the smoked salmon and it was fantastic. Presentation was nice on both starter options. 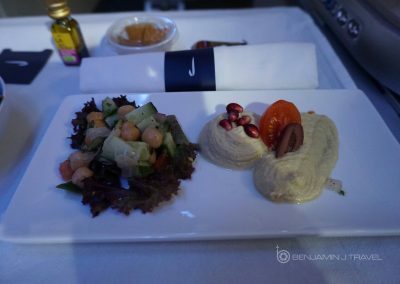 The dinner side salad was also served at the same time as the starter. 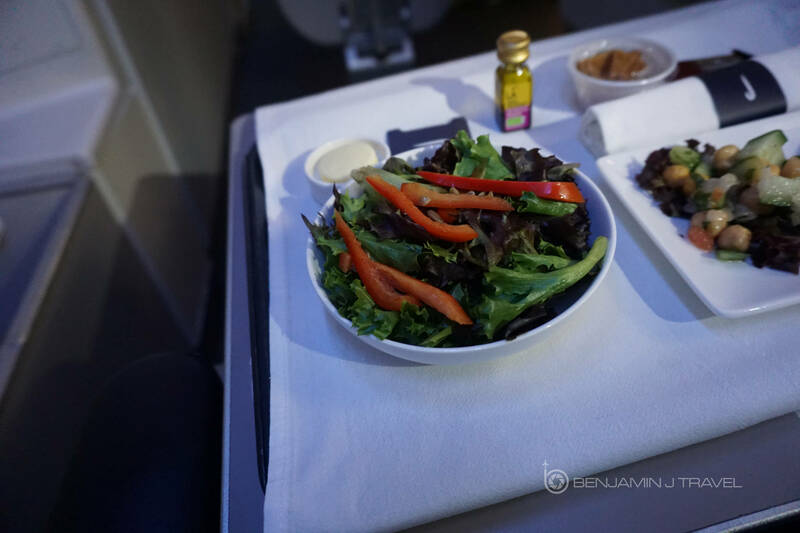 I’m rarely exited about in-flight salads but this one was actually quite good. 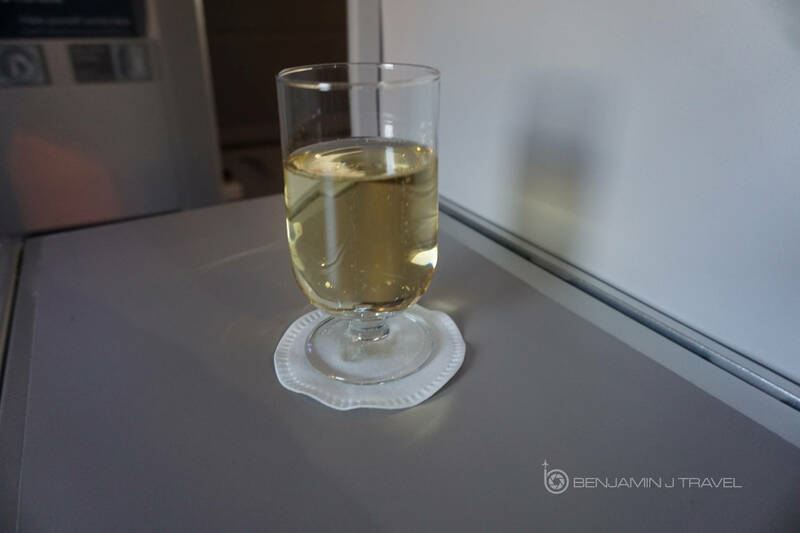 With dinner service, I switched my beverage of choice to the Italian Soave white wine. 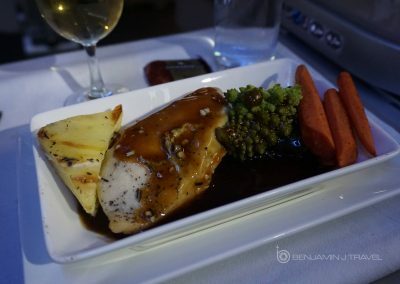 Main entrees followed shortly after where both my Dad and I opted for the chicken breast with dauphinoise potatoes, carrots, and red wine au jus. 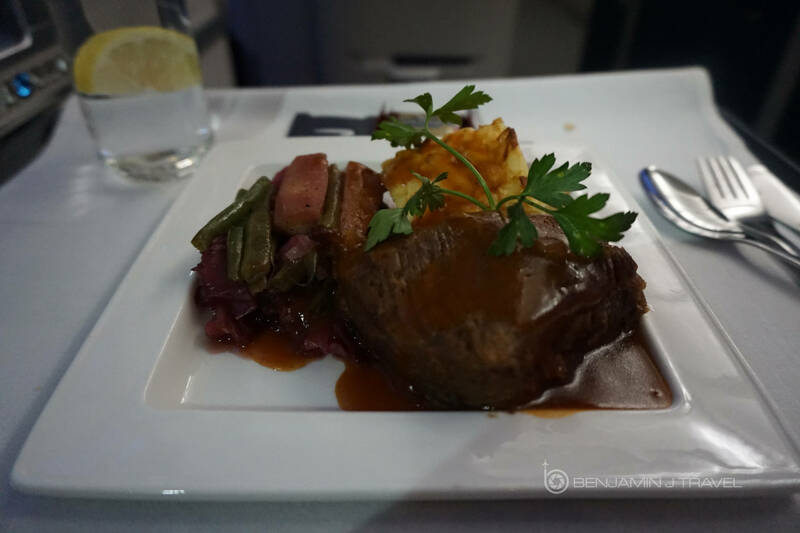 Chris opted for the braised short ribs. 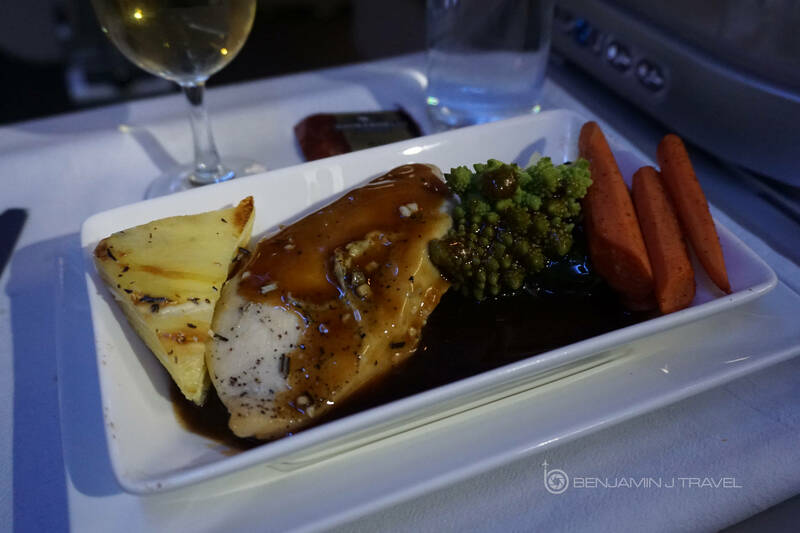 I picked the chicken as beef dishes are often overcooked on planes. But I had a taste of the short ribs and the texture was on point. But not to disappoint, the chicken breast was also very good. Presentation on both entree dishes was good. Wrapping up with desert, Chris and my Dad had the key lime pie which they both enjoyed. 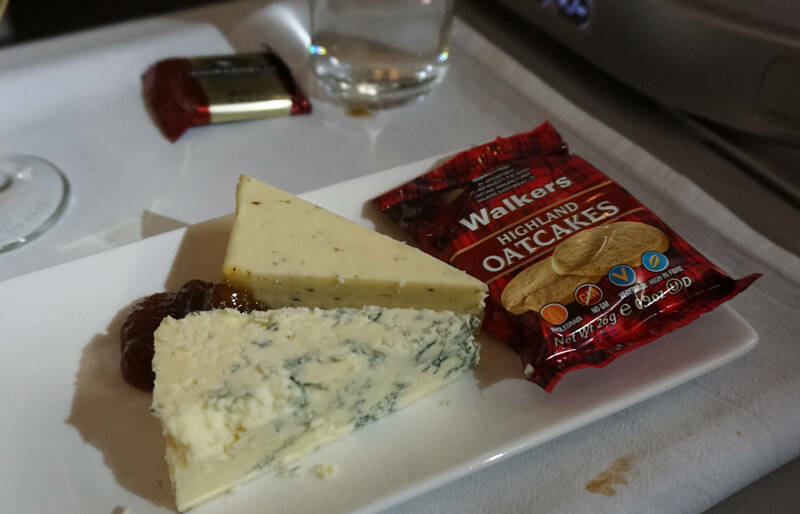 I don’t care much for key lime so I had the cheese & biscuits in a very British fashion. I accidentally sent my biscuits flying off my plate and down the aisle but Hannah kindly brought me new biscuits. Once meals were finished, meal trays were promptly collected. 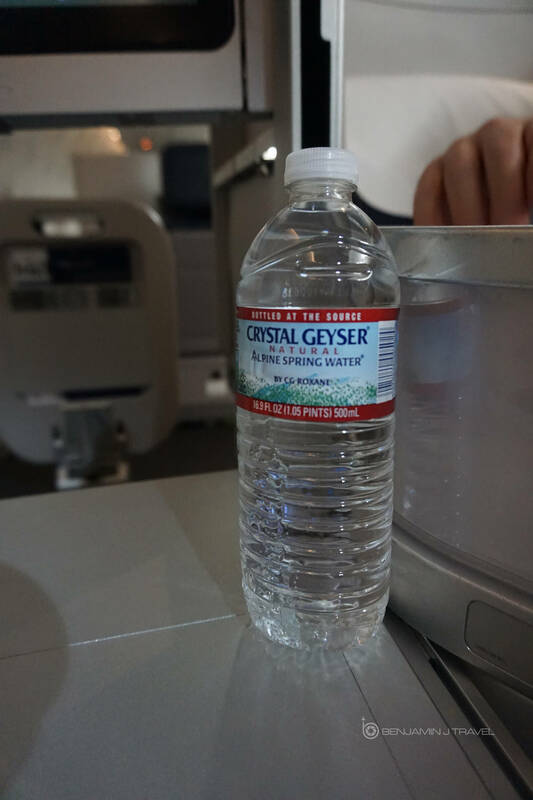 As the cabin began quiet down, water bottles were passed out in the cabin. I wanted to catch a good amount of sleep so I skipped spending any time on my MacBook. 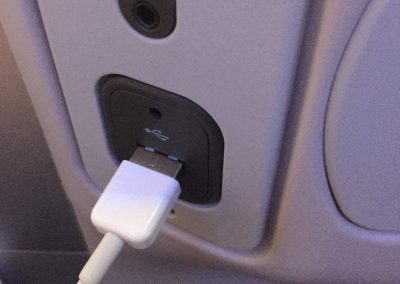 Plus, there’s no WiFi on the majority of British Airways’ planes so you won’t get any connectivity. The Club World seat is easy to make into a lie-flat bed with the push of a button. You also need to lay the foot rest down to complete the full length of the bed. 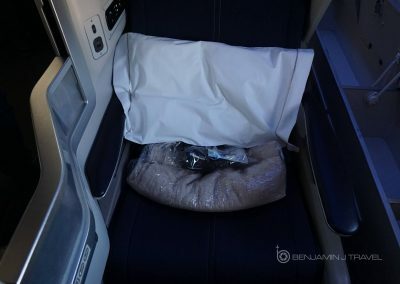 The pillow and blanket on British Airways aren’t the softest unfortunately but they do the job. 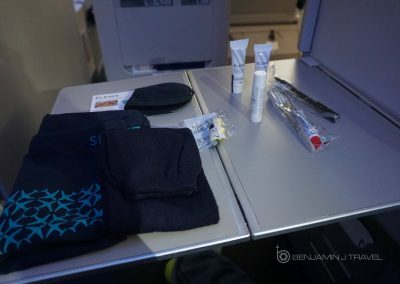 BA doesn’t haven’t my favorite amenity kits although I will say the amenity kit sac is very reusable and makes a great bag for packing shoes in your suitcase. I dozed off for about 2.5 hours although I couldn’t sleep well. 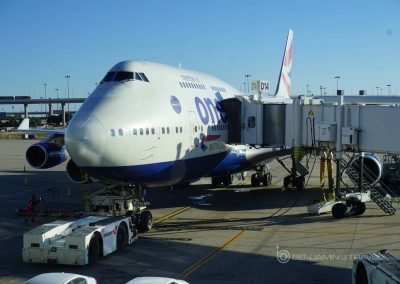 There are not individual air or climate controls on British Airways’ 747s which is common on many carriers. 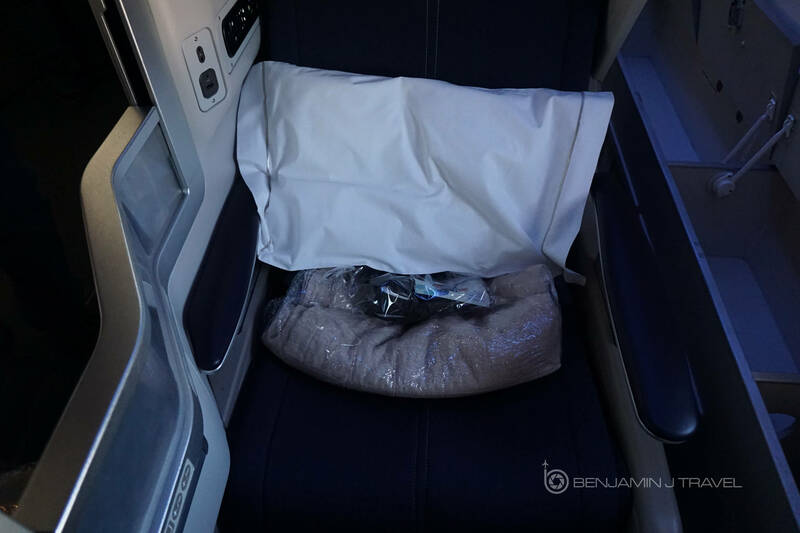 The cabin was quite stuffy which was really my only significant complaint about this flight experience. 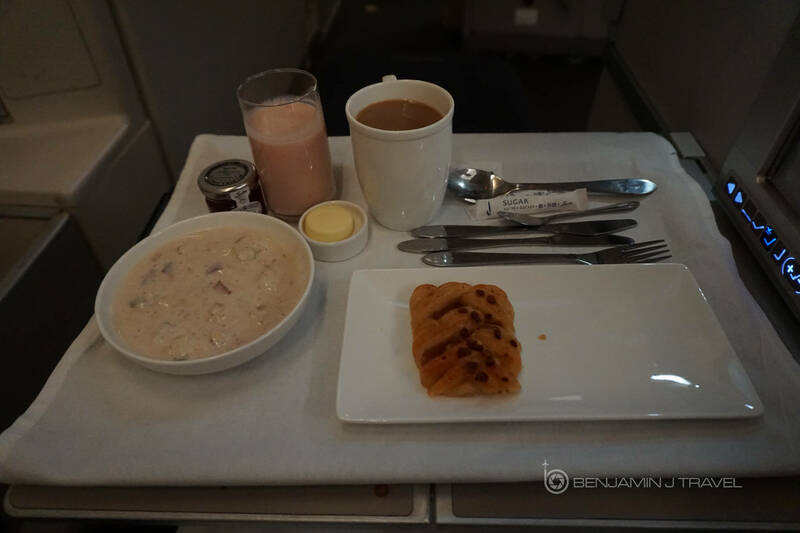 About 90 minutes before landing, the crew began to take request for breakfasts. I opted for the muesli which was served with a hot pastry. Shortly after the muesli was served, warm bacon rolls with ketchup were served. 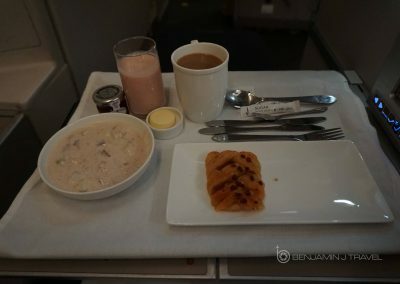 While not bad by any means, I can’t say the breakfast was as good as the custom hot breakfast on our recent flight with Virgin Atlantic. 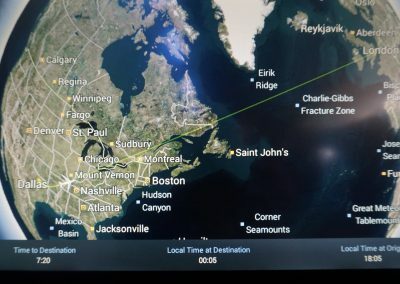 About 40 minutes before landing, breakfast trays were collected and initial landing announcements were made by the captain. We stared to gather up our belonging and prepare for landing. Hannah and John were our crew for the Upper Deck and I can’t say enough nice things about them. 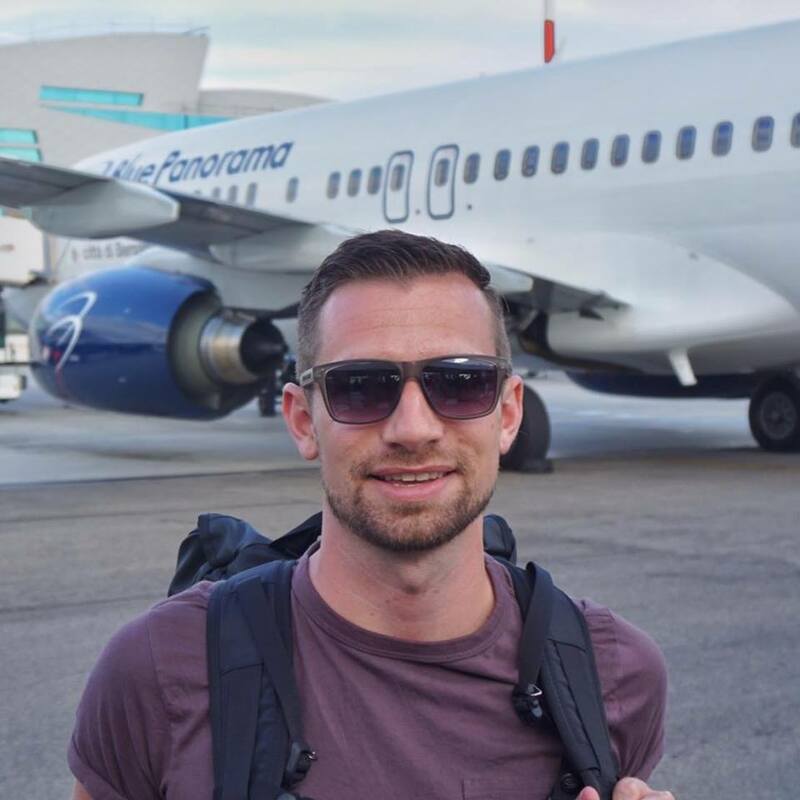 While John was fairly reserved and Hannah incredibly outgoing and chatty, both offered incredible service throughout the flight. 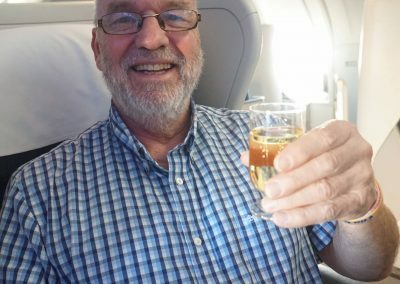 For my Dad’s first long-haul Business Class flight, it was so nice to have such a wonderful crew. The last 10-15 minutes of the flight, Hannah came by to chat with us and it was nice to get to know here a bit. 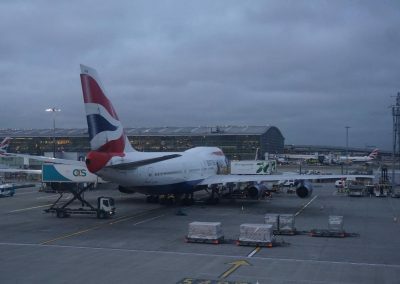 Once on the ground, we made our long taxi to Heathrow’s Terminal 5. Deplaning was fairly quick and we were soon on our way down the stairs to the lower deck. John and Hannah wishes us well on our way and we thanked them for their sincere service throughout the flight. We had a long connection before our flight to Dublin so we headed directly for the Galleries First Lounge at Terminal 5. 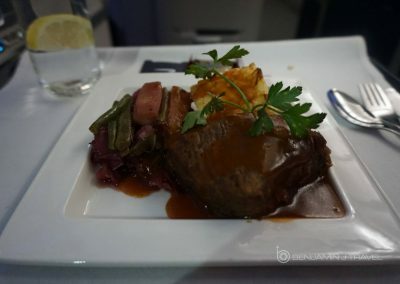 I have to say this was probably my best flight experience with British Airways. 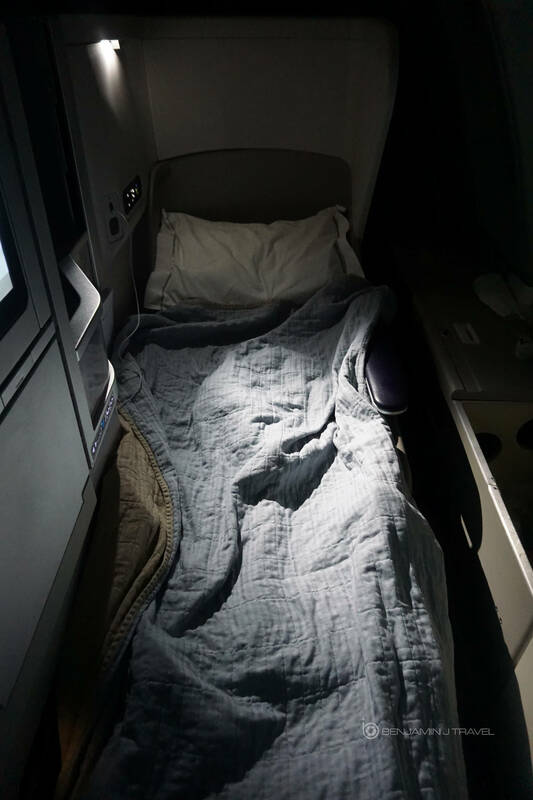 The minor negatives on this flight were the mediocre pillows and blankets and the fussy climate of the plane. But the service was top notch and the food was all very good. 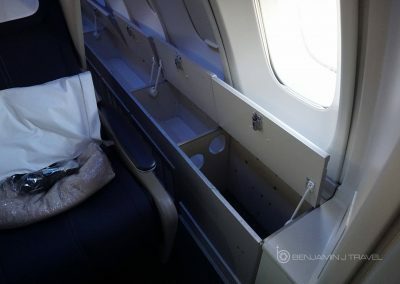 And while this isn’t everyone’s favorite business class seat, I find it comfortable and enjoy the window seat privacy. There wasn’t too much you could have changed to make it a better experience. 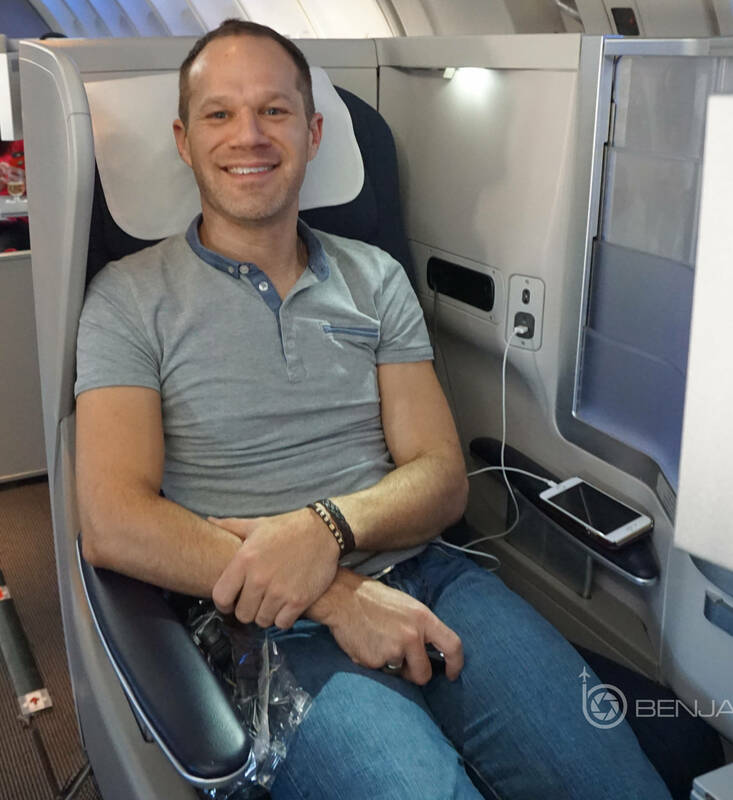 It’s no secret that I’m a OneWorld loyalist but some folks like to complain about British Airways. 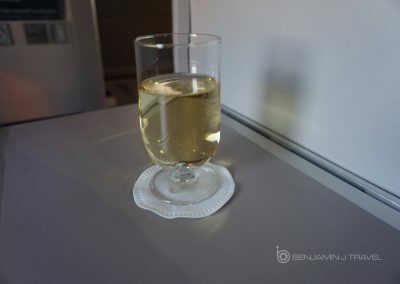 This flight certainly stood out as a very lovely experience but I’ve generally had far more positive than negative experiences with BA. 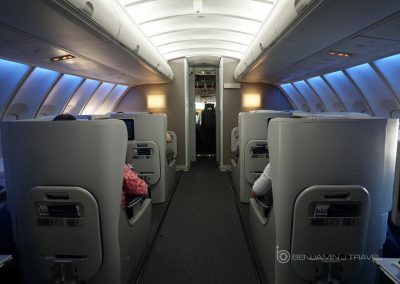 I absolutely fell in love with the mini Club World cabin on the upper deck of British Airways’ 747. 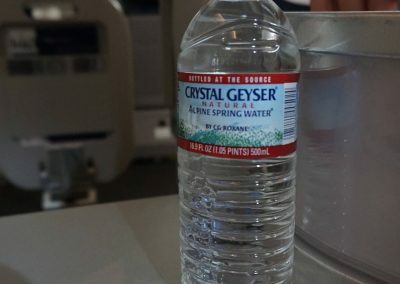 It’s almost like a private jet experience. 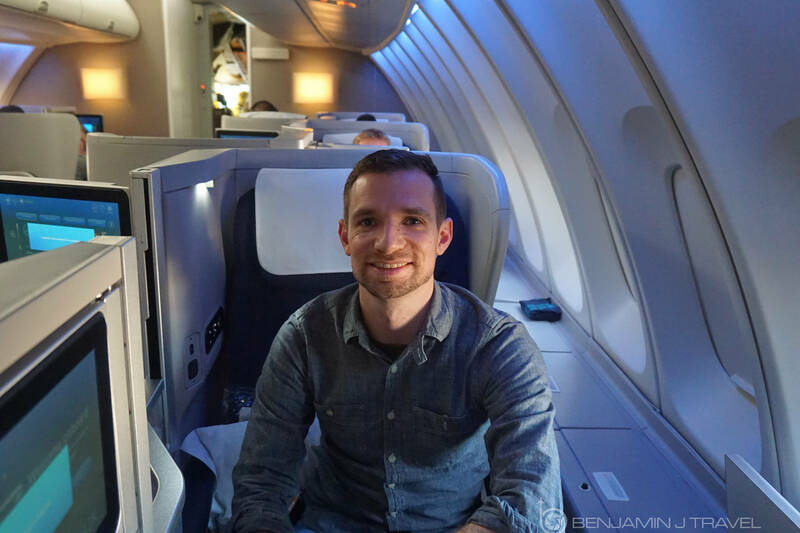 If you find yourself in Club World on the British Airways 747, be sure to snag your seat on the upper deck! 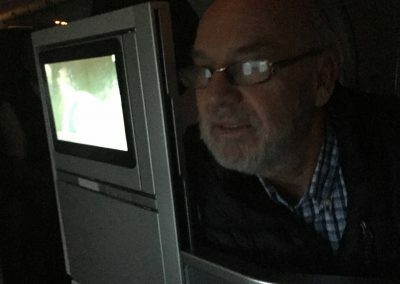 It’s a great feeling being able to take one of your parents across the pond for the first time! Good work Ben. A very fulfilling experience, thank you sir! Great review of the 747-400 Ben. 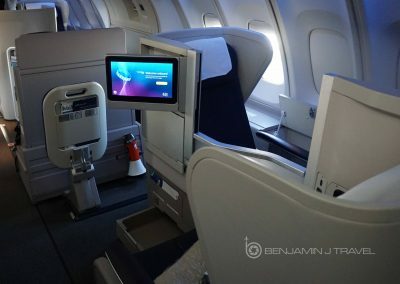 My husband and I are flying from DFW to JNB in March 2018 and have snagged 63K & 63J on the upper deck. Great pics you took of the seats we will be in. 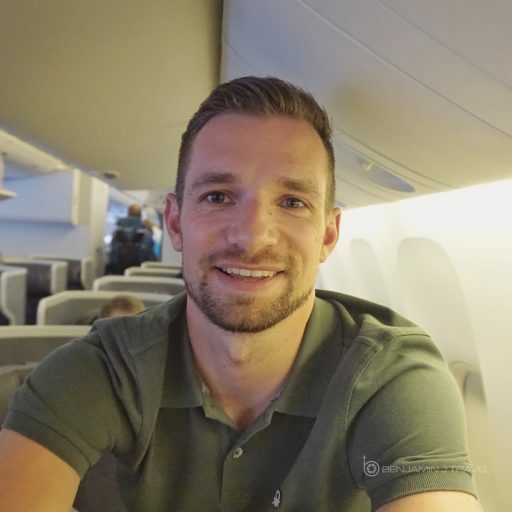 It will be his first time on the 747 and probably his last opportunity since we are OneWorld loyalists as well. 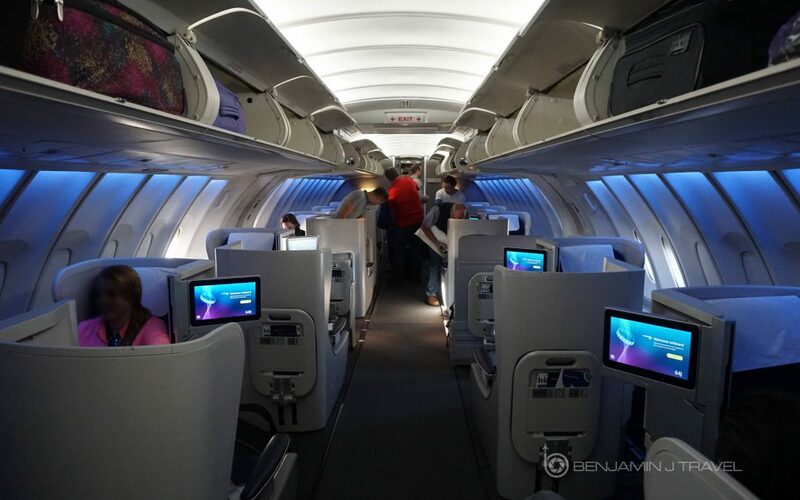 We are flying the 388, for the first time, from LHR to JNB in Business Class, so that should be a cool experience. Wish BA had the lounge on the 388 like Emirates. Really enjoy the reviews of your trips. Thanks for sharing. I hope you have a great trip! Thanks for following along my journey and for your kind words.